Poor production. This is unfortunate. It really is. 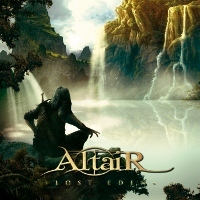 It has let down what is otherwise a really good first effort from Italian Power Metal newcomers, Altair. The musicians have put a lot of effort into this but production wise the drums have been completely neglected and sound like they are programmed, and that's not good. Through straining my ears to hear underneath the mess of vocals and lead guitars turned up WAY too high, I can pick stuff out properly. But we don't want to be doing that. Nobody wants to be doing that. I had to strain to pick out the guitars under the vocals and the bass is barely audible. When there is a solo, of which there are many and they're not bad at all, I can almost imagine the person mixing this throwing the volume right up for the guitars. Now, in saying things like 'mess of vocals' I might be misunderstood to be criticising the vocal performance. No. The vocalist is very talented, and it seems like whoever produced this has not been able to arrange the vocals, or anything else, in a proportionate way. I hate that, because it means that I find myself waiting for the vocals to stop so that I get the chance to hear other things. When the vocals are as good as they are, it's very bad that I find myself wanting them to stop. Lyrical content is quite diverse, for this genre, and that is a big plus. Especially since this is an Italian band writing in English, but they are giving more depth to their lyrics than a lot of English and American Power Metal bands I have heard. I have to respect that. The songs could do with being a little shorter in places, but epic songs are par for the course with Power Metal nowadays so that's not really an issue. Frankly if it wasn't for the horrible production I would have happily listened to lots more from this band. An urgent re-mastering is in order if this album is to get the recognition it deserves. Fantastic potential, and I'm sure with the sound levels sorted out I would have got much more into it than I did. If produced properly, I could easily see myself giving this album a significantly higher rating than I am now.